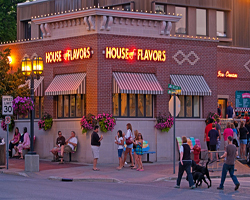 Dishing out the best homemade ice cream in the Midwest. Open for breakfast, lunch and dinner, featuring breakfast served all day, homemade soup, fresh roasted turkey and, of course, ice cream. Note: Some map locations are approximate. Please call the venue at 231.845.5785 for exact directions.